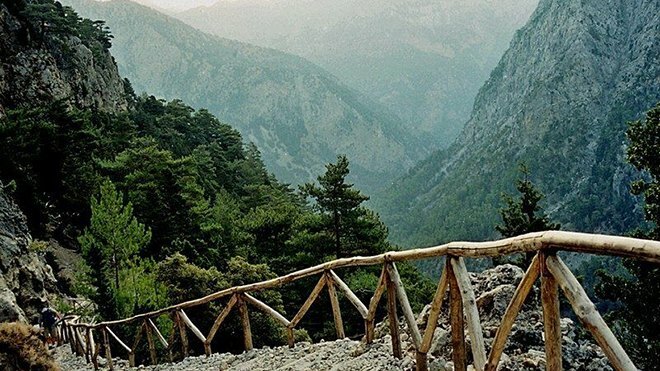 One edge is at a height of 1227m, at the location of Xilokastro on the plateau of Omalos, and the other ends at the village Agia Roumeli on southern Crete. The 18 kms of length offer exciting interchanges of scenery. The first part of the trip, through the Omalos plateau is very steep, and passes through the natural forest of wild pines and cypress. You will find out that the flora and fauna are very rich, that is why it is protected by international treaties. It is estimated that there are around 450 unique species of plants. It is also extremely possible for you to meet, in the middle of the canyon, the famous wild goats of Crete, known as “Kri-Kri”. Next, you will meet the abandoned medieval village of Samaria, which was evacuated in 1962, when the founding of the National Park was announced. After all, the byzantine churches remind us that up until the previous century, the canyon was inhabited. When you reach the end of the canyon, the voyage continues next to the small fountain, which barely manages to keep any water during summertime, but in wintertime overflows the bed, rendering the canyon impassable. Here you can admire the vertical mountainsides, where the intense geological dimples can be seen. A little before the end, you will meet the narrowest point of the journey, the “Sideroportes” (iron doors), whose width is just 3 meters. 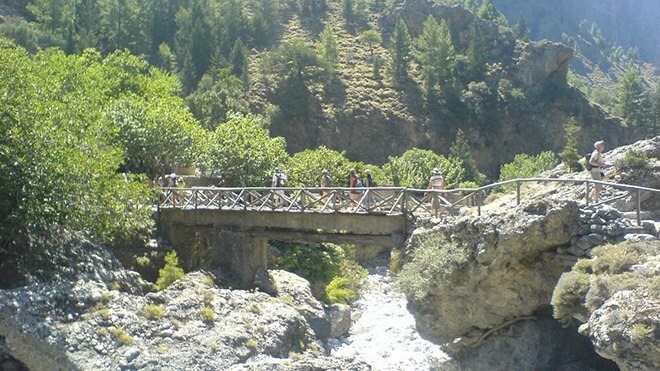 Samaria is fully equipped, and the paths are signed and modified especially for facilitation of hiking. At the entrance, and also inside the canyon, there are guards ready to help you with any emergency. Setting aside the fact that it is a 5 hours walk, the difficulty is not high, and it is accessible to the public from the end of spring, to the beginning of autumn. At various points in the canyon, there are toilets and fountains tfor the visitors. After the exit from the National Park, a ticket check takes pace to ensure that no visitor has been trapped inside tha canyon for any reason. The canyon is accessible only from May to October, as the rain can make certain passages dangerous. After exiting the canyon, the blue waters of Agia Roumeli can be seen in the distance like an oasis.